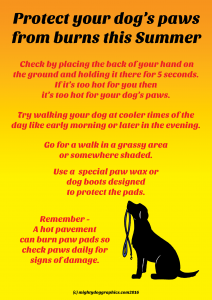 Kate and Don offer several tips on keeping your pets safe during the hotter and more active summer months. They discuss the heat and the sun, water safety, bug bites, parasites, allergies, herbicides, pesticides, and holiday gatherings. Mighty Dog Graphics ( https://www.facebook.com/mightydoggraphics/ ) is located in Dublin, Ireland. 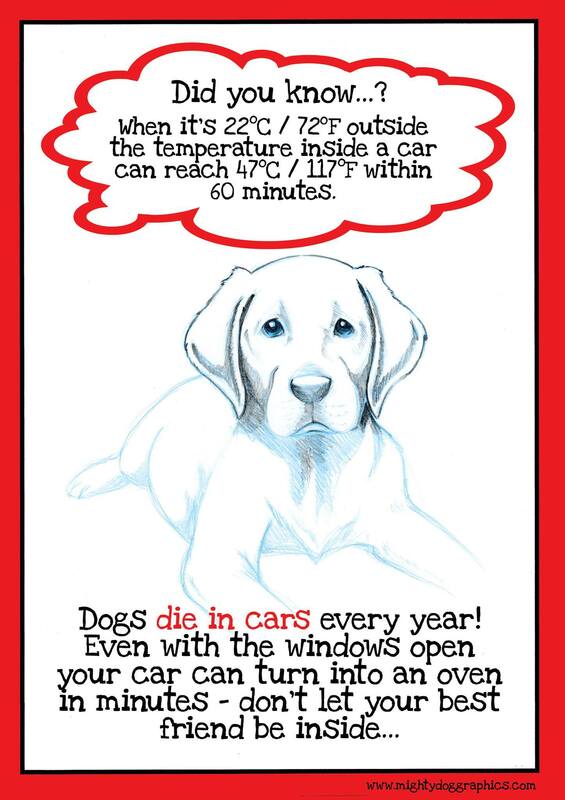 They create some excellent educational posters for pet parents and pet care professionals. They have graciously allowed us to share some of these posters with you. 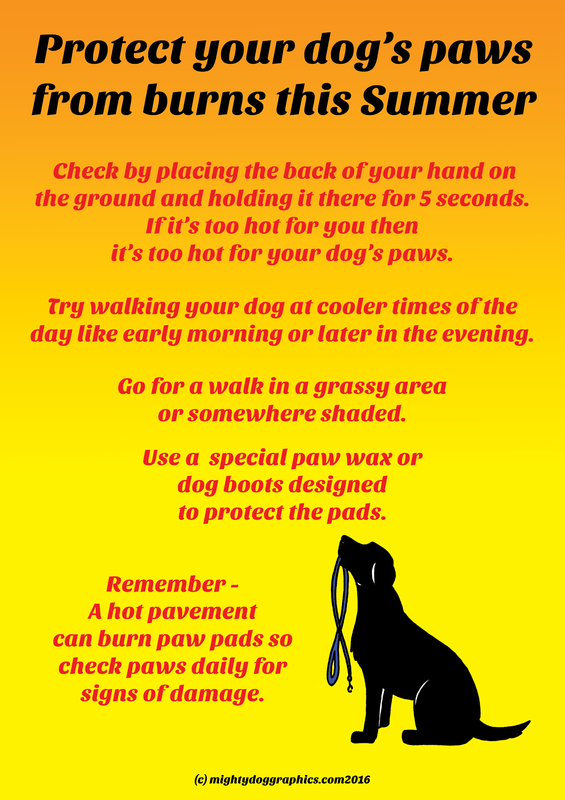 This month I am including two graphics, both dealing with the effect higher temperatures can have on our pets. 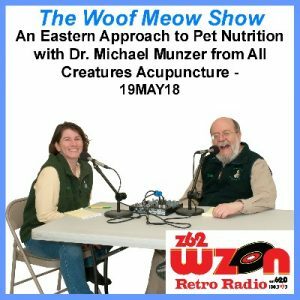 In this episode of The Woof Meow Show from May 19th, 2018, Don learns about the Eastern or Chinese Medicine approach to nutrition from Dr. Michael Munzer from All Creatures Acupuncture. Last year Dr. Munzer completed a certification program in Chinese Food Therapy from the Chi Institute of Traditional Chinese Veterinary Medicine. He discusses the critical differences in the Chinese Medicine approach to nutrition as compared to what he learned in veterinary school where the approach was what is the bare minimum of nutrition necessary to sustain life. Chinese medicine looks at food more deeply for each individual patient. This can make the method better suited for treating specific health issues. Tune in and learn about this interesting approach to feeding your pet for optimal health from Dr. Michael Munzer. In this episode of The Woof Meow Show from May 12th, 2018, Don talks with Rachael Pelletier and Giselle Bridges about essential oils and there use with pets. We start off with an overview, describing what essential oils are and how they are used. The question of the safe use of essential oils with pets is addressed as well as how they can be used with pets. Rachael and Giselle share stories about animals they have helped with essential oils as well as ways you can use essential oil in your home that will benefit both you and your pets. This month I will address the fifth freedom, Freedom from Fear and Distress. I will be readdressing some of the same topics from part 2 of this series, Freedom from Discomfort, as fear and distress are an extension of discomfort, especially when considering our dog’s emotional state. I genuinely believe that no psychologically healthy human would ever intentionally cause their pet fear or distress. 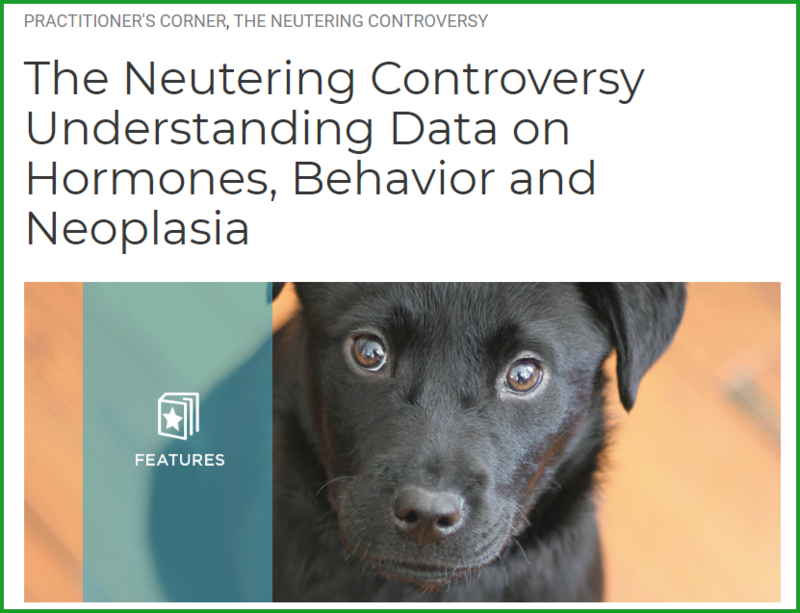 However, a lack of knowledge — or incorrect information about animal behavior often is a cause of fear and distress in dogs. Experiencing fear and distress is normal for any living thing throughout its life. However, since one fearful event can be traumatic enough to create a permanent and debilitating disability, it is essential we understand fear and distress and that we do everything possible to minimize its effect on our dog. Can you readily tell when your dog is fearful or stressed? Dogs typically do one of four things when afraid. 1) They flee and run away as fast as they can from whatever it is that has scared them. 2) They fight by barking, growling, lunging at, and attacking whatever has threatened them. 3) They freeze in place, not moving a muscle, and not making eye contact with what they fear. 4) They fidget about, displaying normal behaviors (sniffing, scratching, etc.) in an abnormal context while ignoring the threat. These four are the most extreme reactions, but well before your dog exhibits any of those behaviors they will give you subtle signs of their emotional distress. It is essential that you know and understand these signs so that you can intervene early. 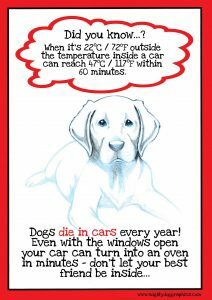 Unfortunately, when many dog parents see their dog freezing or fidgeting about they say “Oh, he’s fine” not understanding that the dog is in fact distressed. 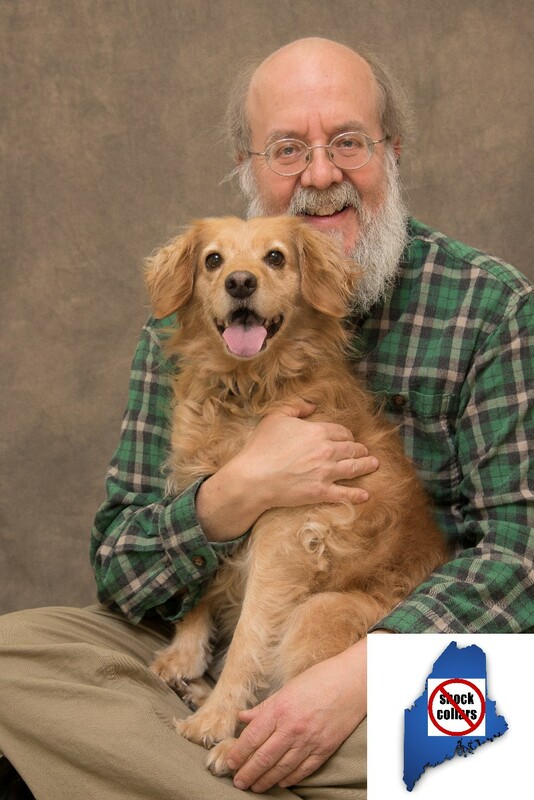 ( FMI – http://bit.ly/DogsSignsofFear ). Do you actively look out for your dog’s best interests so that you can protect them from people that do NOT understand canine body language? Most people do not realize that not all dogs want to interact with people nor do those people comprehend the subtle signs that a dog gives that says “please leave me alone.” Most dogs do not want to bite, but only do so when they feel they have no other option. 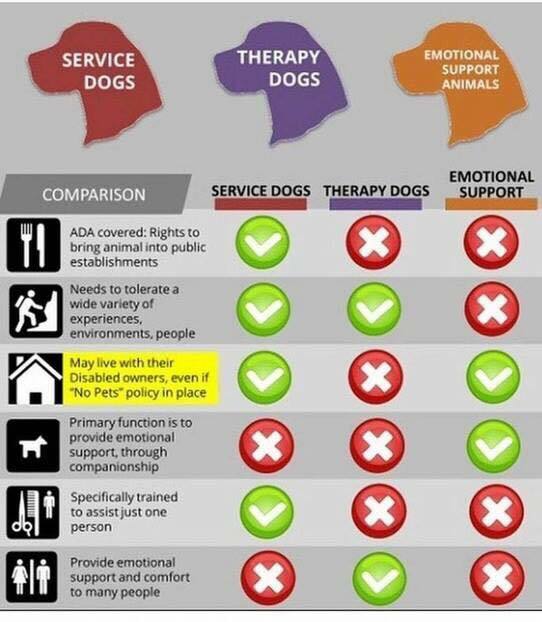 As our dog’s caregiver, we have a responsibility to look out for our dog’s welfare which means intervening when others do not respect our dogs right not to interact. Additionally, we need to understand that sometimes the best thing we can do for our dog is to leave them at home. Not all dogs enjoy walking in the animal shelters annual fundraiser. Do you understand the necessity of providing both physical and mental stimulation for your dog while not letting either go to extremes? A lack of adequate physical and mental stimulation can cause a pet to be distressed. However, too much stimulation and exercise can also be even more detrimental, creating a state of chronic stress. Playing fetch or going to the dog park every day can become addictive, causing chemical changes in the brain which can contribute to distress and other behavior problems. Do you understand that while the dog is a social species, they may not like every dog they encounter, even ones that you may want to add to your family? While the domestic dog is considered to be a social animal, some are more social than others. Dogs do not automatically like on another. If we force a dog to live with another pet that they are afraid of, we are causing fear and distress. Learn to Appreciate Your Dogs Nose! Spring has finally sprung, and in case you have not noticed, your dog is probably attracted to all of the new scents in the air. 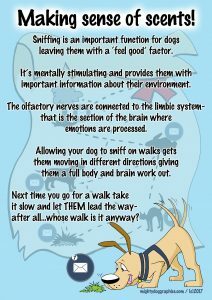 Rather than let your dog’s busy nose frustrate you, why not revel and rejoice in your dog’s amazing olfactory abilities. Sniffing is essential to your dog’s very existence. Dogs use their nose to survive and for the pure joy of discovery. Not allowing your dog to use their nose, or getting upset when they stop to take a whiff while on your walk, is like someone preventing from you doing something you find essential in your life. If you find your dog’s need to sniff slows you down on your walk, then leave your dog at home and walk for your enjoyment. However, remember that when you get back home, you owe the dog a walk that is solely focused on their needs. Let your dog sniff and explore. 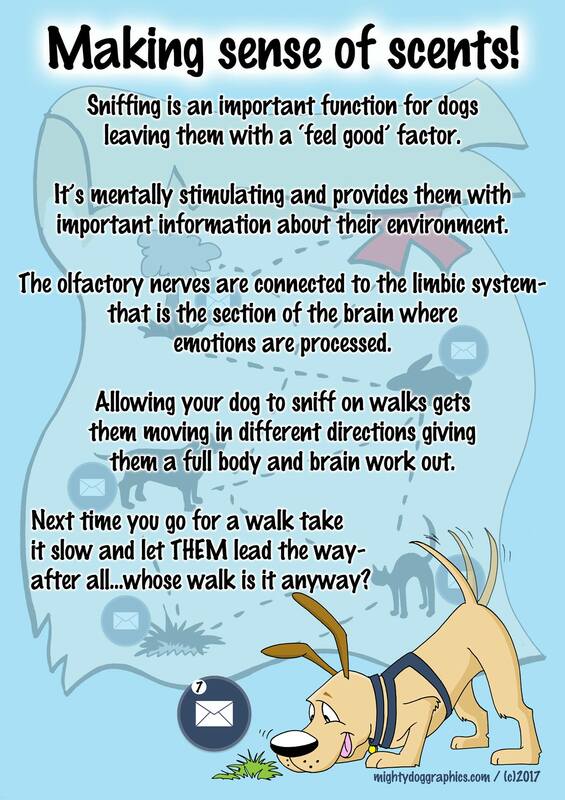 Your dog will be both mentally and physically stimulated and happy. Please do NOT forbid the sniffing!